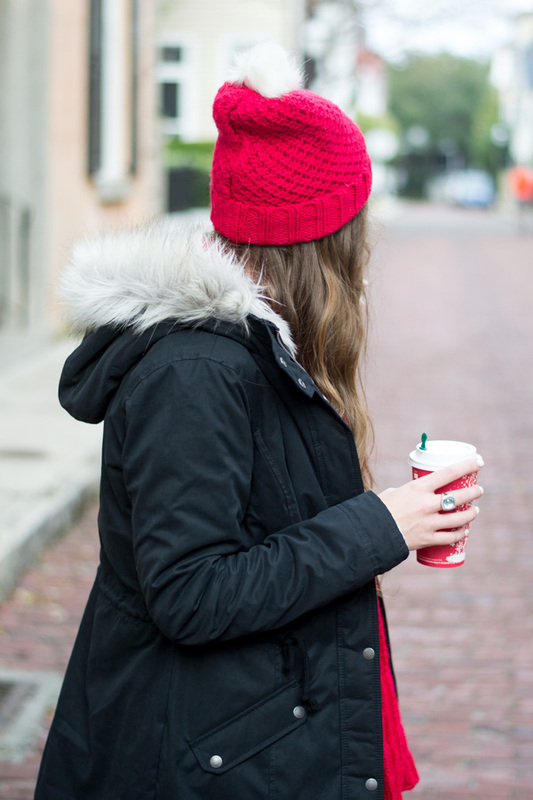 Hollister is such a great place to check out if you're looking to buy some winter accessories! They have such a great selection and everything is on major sale right now! My jacket is under $100 and my hat, scarf, and socks are all under $10! Make sure you get something for everyone on your list! *Thank you to Hollister Co. for sponsoring this post! As always, all styling and opinions are my own. 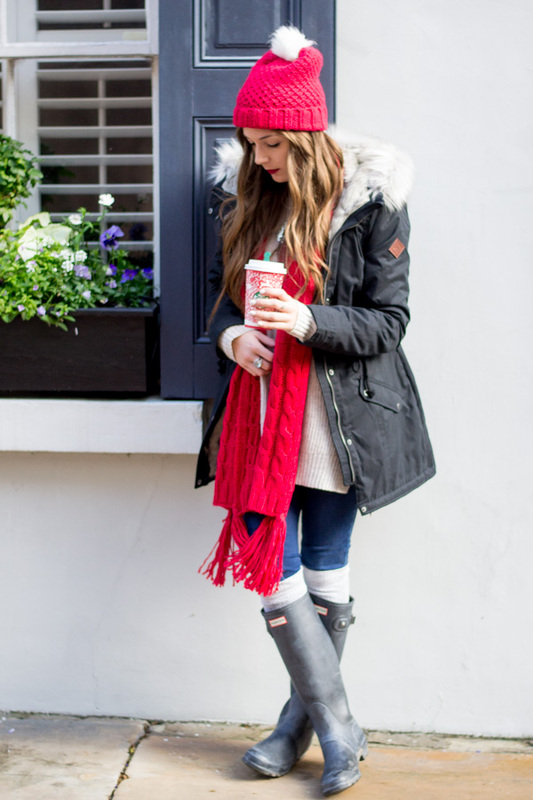 Love this outfit especially the beanie and hunter boots! This is such a perfect holiday look! Love the hints of red. Just ordered that same monogram necklace and I can't wait to wear it! 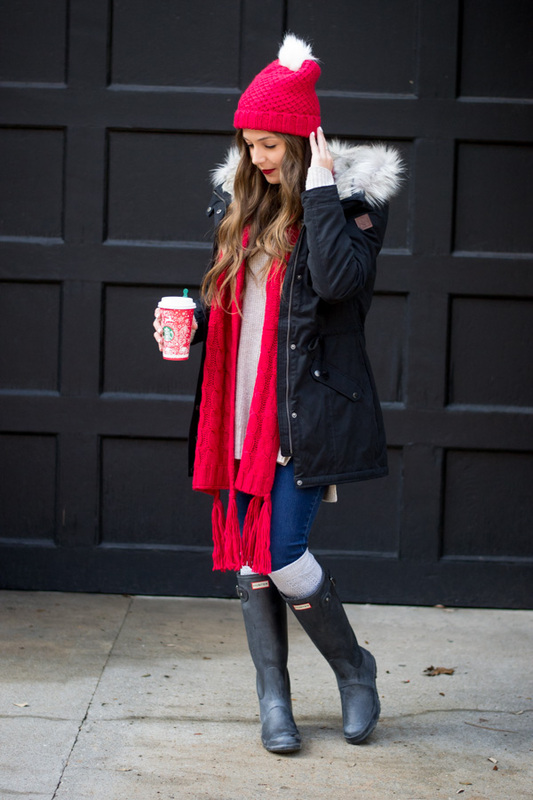 I"m obsessed with those Hunter boots and that beanie! This is such a cute look. So fashionable for the cold weather! I love all the pops of red too. What great ideas for last minute gifts!! Your entire outfit is so cute and looks warm and cozy! I really need this jacket girl! These are great ideas! I've been seeing hunter boots everywhere! Your outfit looks so cute and comfy! You are so cute!!! I love all the red. The scarf is perfect. Love all the pops of red! So Christmas-y! Happy Holidays! You can never go wrong with warm weather wear as last minute gifts! Great finds! Definitely really great last-minute ideas! They won't seem last minute at all! 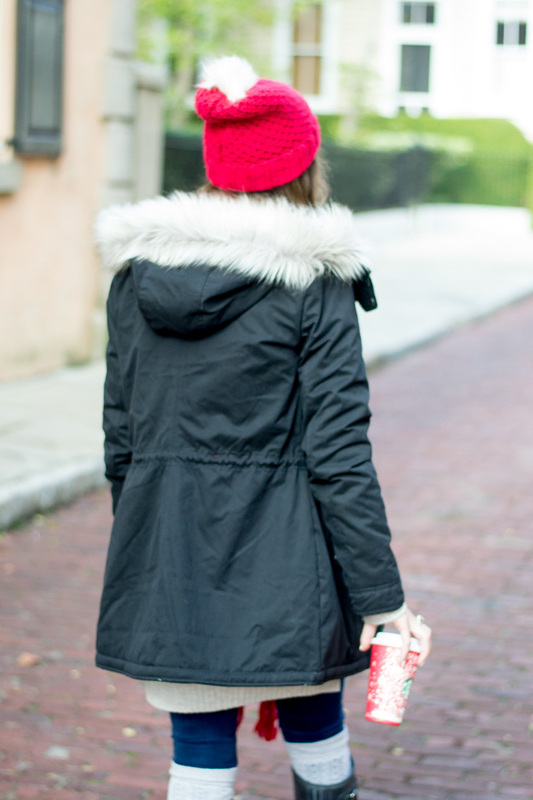 You can never go wrong with a winter coat! I am loving that coat, especially the way you paired it with the pops of red! Just gorgeous! I can seriously never get enough red. 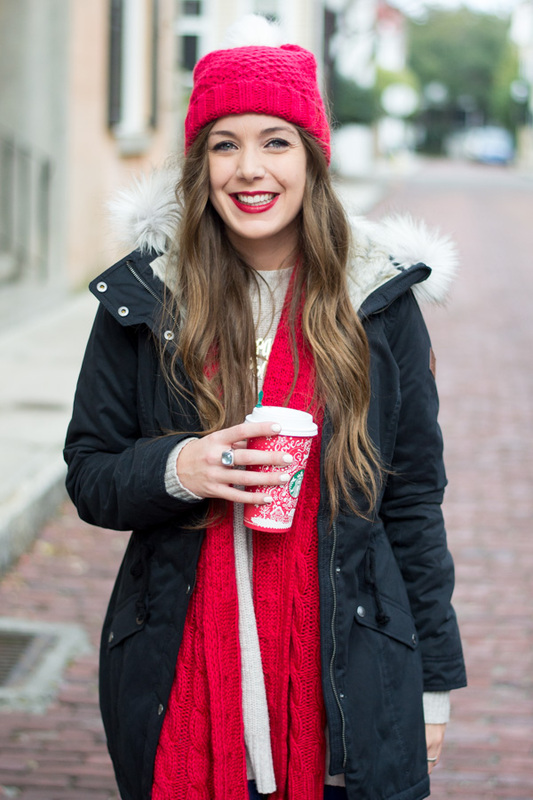 I love the red cups, red lips, red scarf- all of it!! Such a cute jacket! 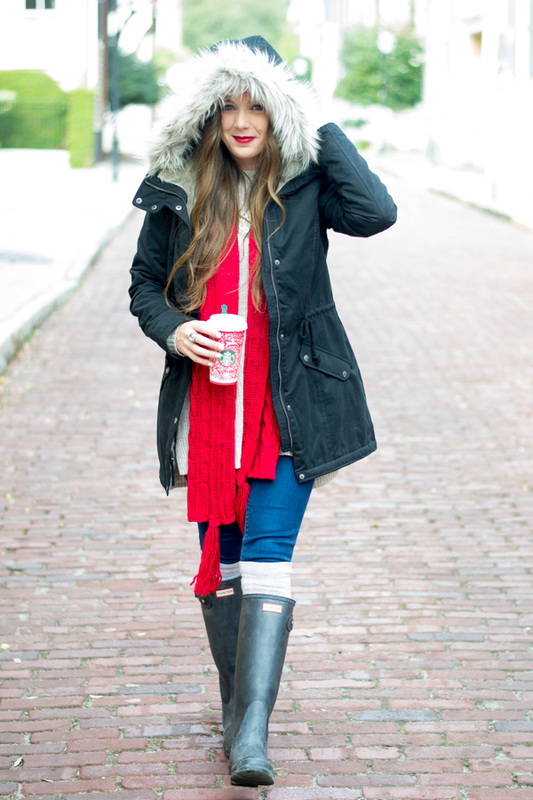 Love the fur trim and pops of red! Love all this pretty red! It's your color! love this fab winter outfit! Love the pop of red. Great gift ideas too! Definitely need some boot socks for my friends with Hunter boots. And can't forget a cute beanie! Love this for the cold weather! Looks so comfy, yet put together! Forget gifting-i am getting all of this for myself haha. love your outfit! so chic and comfy. LOVE that coat!! The fur around the hood is so great!! I love how it frames your face. Definitely need to check out Hollister!! I can hardly believe it's Christmas week! That jacket is awesome, I'd love that as a last minute gift for myself! You look so good, I am loving that scarf girl. this whole look seems super cozy. Love this look! So so cute! Loving this layered look babe! I love that jacket and beanie! Such a warm look! 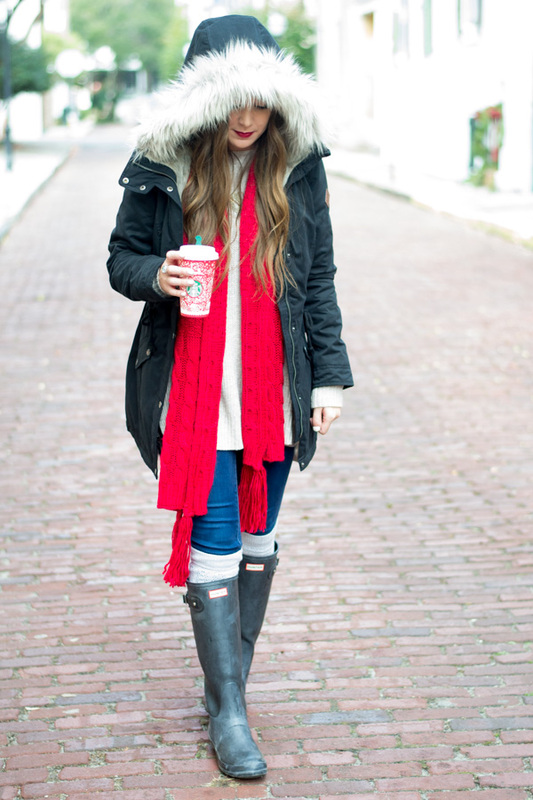 such a cute and cozy look, love all the pops of red! Those boot socks are adorable, and I LOVE that bright red on you. It looks so good!! I would love if ANY of these showed up in my Christmas gifts. Love the red! I think a scarf is always a great gift (I like to be on the receiving end, for sure)! Great ideas! I love the pops of red in this outfit!! Your jacket looks super warm and cozy too. I love that you paired this look with your Hunter boots! I love the pop of color!! those socks and hat look so comfy, this entire outfit looks cozy for the winter! Such a pretty look I am loving the Christmas red! There is nothing like wearing red at Christmas time! Your outfit is adorable and I'm loving your Hunter boots. Yes, yes, YES I want this whole outifit!! Hollister is such a great store! I love the way you've styled this entire outfit. Looks fantastic with the pop of red! Red is one of my favorite colors, especially during the bleak winter months! Such a cute outfit!!! Love these last minute gift ideas too. I love this coat! I think I'm going to have to gift myself these! Love the pop of red! 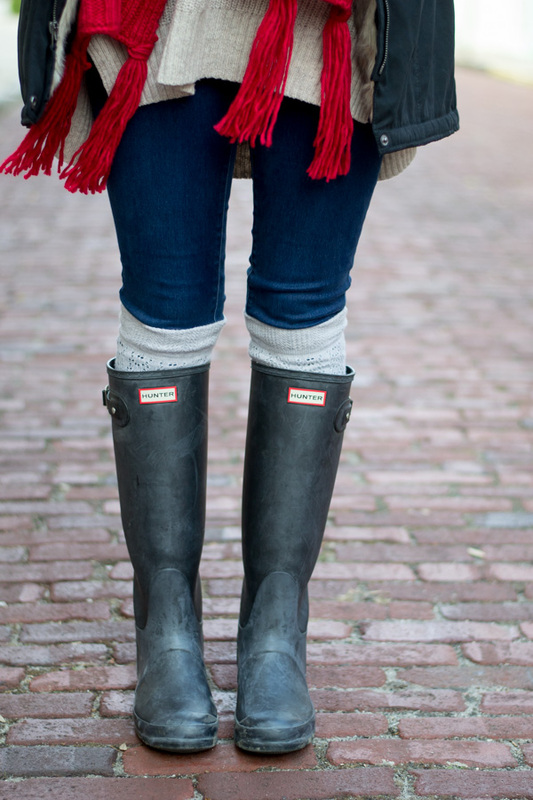 Hunter boots are a classic too! love the way you styled this look! I always love getting cold weather accessories! Great picks! I am loving everything about this look from the scarf to the coat to the boots. You are Gorgeous ❤❤.. Red looks divine on you!!! You are rockin' that jacket.. total perfection!! Love this so much! Such a great, cozy look! You look adorable with that pop of red! Totally loving this look! So cozy and festive. Merry almost Christmas! I love these pops of red! 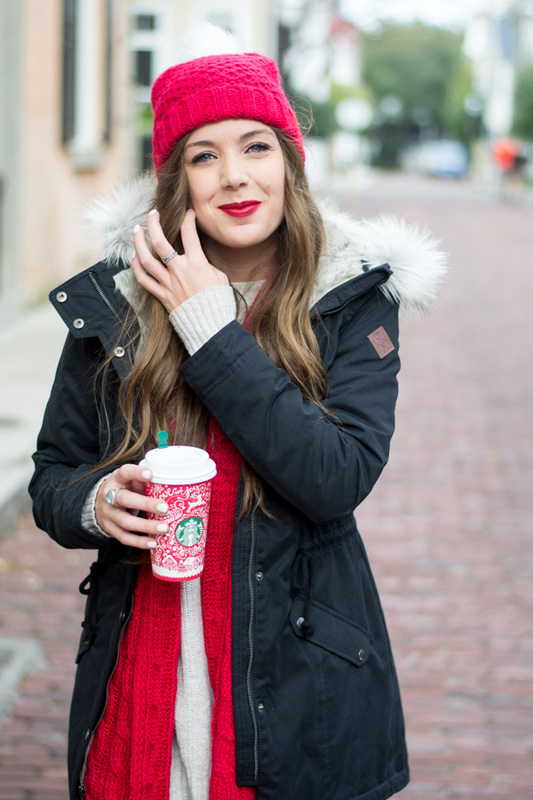 Such a cute and casual holiday look! Such great ideas! I hope you had a great Christmas! 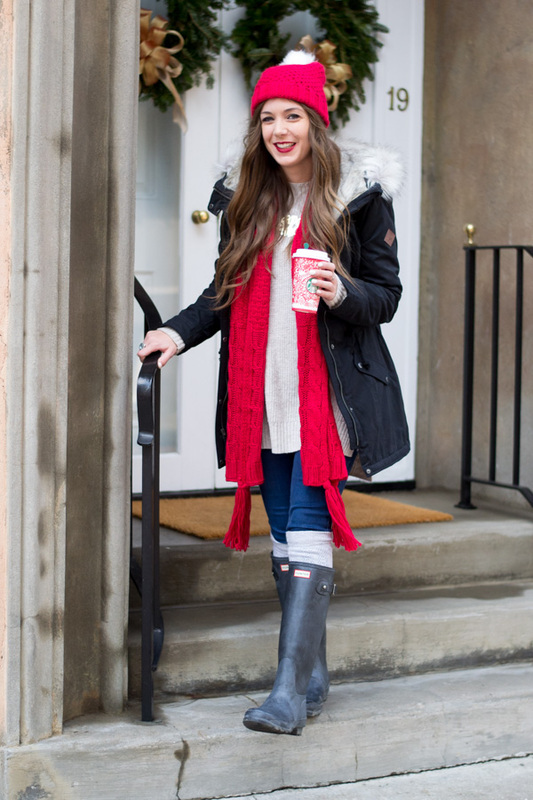 I love the hunter boots and the splash of red makes the whole outfit pop! I got a few of these items for Christmas, so this post was spot on! You make me wish I had the Hunter boots in black!! Love this look!! Loving those Hunter boots, girl! Too cute! Hope you had an amazing holiday! I haven't thought of Hollister in so long...looks like I've gotta head back and see what's new!